All Saints, Laughton01323 811177work ChurchThe nave is the oldest part of the church and is in the 13th century Early English style. There are still two of the simple lancet windows characteristic of the period remaining, one in the south wall and one in the north; the other windows in the nave are Perpendicular, a division of English Gothic architecture covering the period from c.1335-50 to c.1530. Both outside walls of the nave have examples of the local 'winklestone', Sussex marble. This is a limestone formed from fossilised freshwater snail shells, Viviparus paludina. As the stone weathers, the fossils can easily be seen, especially on the south wall between the porch and the chancel. From the external stonework, it appears that the nave roof has been raised from its original position. Inside the church, on the north wall at the east end of the nave can be seen an aumbry, a recess to hold sacred vessels for the Mass, and a piscina, a stone basin with a drainage hole where water used at Mass is poured away. There is another piscina on the south wall opposite. These probably indicate the existence of side altars in medieval times. The roof is of single frame construction with tie beams. It is unusual in that the structure employs king struts supporting roof beams rather than king posts supporting a ridge beam. Some of the medieval timber used still remains. On the beam in front of the chancel arch, are three pieces of church armour. Of the two helmets, one is Tudor, perhaps about 1540. The other, together with the third piece with the gorget or throat plate attached to it, dates from about 1660 and is a funerary helmet, specially made to hang over the tomb of a knight. The chancel arch is Early English and traces can be seen on its soffit where the rood screen divided the nave from the chancel. The chancel arch is set off-centre to the nave, symbolic of the declination of Christ’s head on the Cross. Above the chancel arch are the painted arms of George III. The outside of the chancel is unusual with diagonally set crocket pinnacles on the east corner. The priest's door has a high double-curved or ogee arch with delicate quatrefoils. In contrast, the bleak south windows of the chancel seem out of keeping. The tower is Perpendicular and has the Pelham buckle carved on the label stops of the projecting moulding of the west doorway. The two shields in the spandrels are now unreadable; the left one had the three pelicans of the Pelham arms, the right shield bore the Colbrond arms of a fesse. The two buttresses at the west end are not quite symmetrical. They may have been later additions to enable the tower to take the weight of the bells. The tower now contains a ring of six bells. A sacring bell was provided by William Pelham’s bequest in 1503 but this would have hung inside the church. When the tower first had bells installed is unknown but in 1686 it was reported that 'all things are in good order'. Five bells were cast, or more probably recast from the original bell metal, for the church in 1724 by John Waylett. He was an itinerant bell founder and would have cast the bells locally. Two of these bells were subsequently recast. The bells are hung in a cast iron side frame. The interior of the church has changed considerably over the centuries. The gallery was added in 1821 to provide extra seating and to house the church musicians. In 1883 there was a major restoration of the church but the gallery was not removed until later, probably at the same time the box pews and the old three-decker pulpit were removed. The nave was refloored and a new organ was installed. The stone slab roof has been replaced with slates. 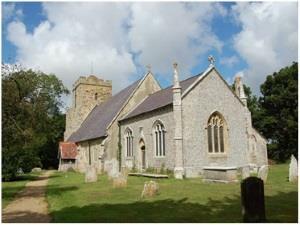 The nave is the oldest part of the church and is in the 13th century Early English style. There are still two of the simple lancet windows characteristic of the period remaining, one in the south wall and one in the north; the other windows in the nave are Perpendicular, a division of English Gothic architecture covering the period from c.1335-50 to c.1530. The old window of the chancel was removed during the rebuilding of 1765, but that was moved to the manor, Foxhunt Green when the current window was installed in 1884. The stained glass in the east window and south window in the chancel is Victorian and in memory of two Earls of Chichester and other family members. The window in the south wall of the nave is dedicated to the memory of Sir James Duke of Laughton and his son.